Draw-down press with speeds adjustable from one to ten seconds. Used with liquids, powders, and paste coatings. 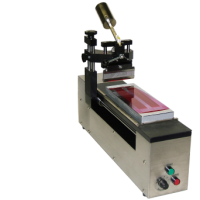 Get consistent use of grind gages using the ADM 2 automatic draw-down machine from Little Joe Industries. The ADM 2 is designed to be durable and simple to operate. Designed for use with liquid and paste coatings. Consistent and accurate scraper force adjustable from 1.75 to 6 kg (3.5 to13 pounds). Rigidly held scraper provides consistent scraper angle. Uses existing grind gauges and scrapers from your current supplier. Works with grind gauges and with draw-down pads. Requires less operator training and supervision on proper grind gage use. The scraper is held at an 85-degree angle. This allows using each side of the scraper twice, effectively giving you four scraper edges instead of just two and doubling the life of each scraper compared to a 90-degree angle. 90-degree versions are available [Link] by special order. The ADM also makes color comparison draw downs on draw down pads using a scraper. This requires the purchase of a Draw Down Kit [Link]. Specifications subject to chage. Grid gages not included. US and foreign patents apply. 10-second, fixed speed process moves the scraper the length of the grind gauge. Designed for use with paste coatings. Consistent and accurate scraper force adjustable from 1.75 to 6 Kgs (3.5 to 13 pounds). Allows less operator training and supervision on proper grind gage use. 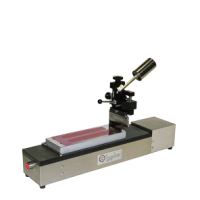 Uses existing grind gages and scrapers from your current supplier. Specifications subject to change. Grind gages not included. US and foreign patents apply.